Camrose County is located a short drive southeast of Edmonton. This area is well known for its mixed farming, as well as for its population of 8,000 people who live in friendly communities or in the countryside surrounded by rolling hills and dancing grain fields. Round Hill Located northeast of Camrose along Highway 834 is the friendly hamlet of Round Hill. Newly developed ball diamonds, campsites, and full service recreation buildings make this an ideal place to camp during special events. For those golfing, Coal Creek Golf Resort is only 10 minutes away. 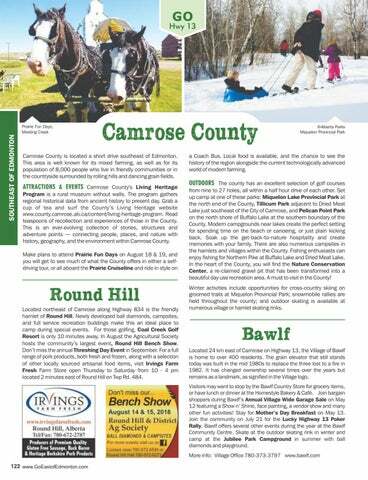 In August the Agricultural Society hosts the community’s largest event, Round Hill Bench Show. Don’t miss the annual Threshing Day Event in September. For a full range of pork products, both fresh and frozen, along with a selection of other locally sourced artisanal food items, visit Irvings Farm Fresh Farm Store open Thursday to Saturday from 10 - 4 pm located 2 minutes east of Round Hill on Twp Rd. 484.
a Coach Bus. Local food is available, and the chance to see the history of the region alongside the current technologically advanced world of modern farming. OUTDOORS The county has an excellent selection of golf courses from nine to 27 holes, all within a half hour drive of each other. Set up camp at one of these parks: Miquelon Lake Provincial Park at the north end of the County, Tillicum Park adjacent to Dried Meat Lake just southeast of the City of Camrose, and Pelican Point Park on the north shore of Buffalo Lake at the southern boundary of the County. Modern campgrounds near lakes create the perfect setting for spending time on the beach or canoeing, or just plain kicking back. Soak up the get-back-to-nature hospitality and create memories with your family. There are also numerous campsites in the hamlets and villages within the County. Fishing enthusiasts can enjoy fishing for Northern Pike at Buffalo Lake and Dried Meat Lake. In the heart of the County, you will find the Nature Conservation Center, a re-claimed gravel pit that has been transformed into a beautiful day use recreation area. A must to visit in the County! Winter activities include opportunities for cross-country skiing on groomed trails at Miquelon Provincial Park; snowmobile rallies are held throughout the county; and outdoor skating is available at numerous village or hamlet skating rinks.